Colgate is one of the major brands for toothpate in Hong Kong. Competition is strong in Asia with other multinational brands fighting for the top spot – see our last post on Crest/Ruilli on-pack in China. 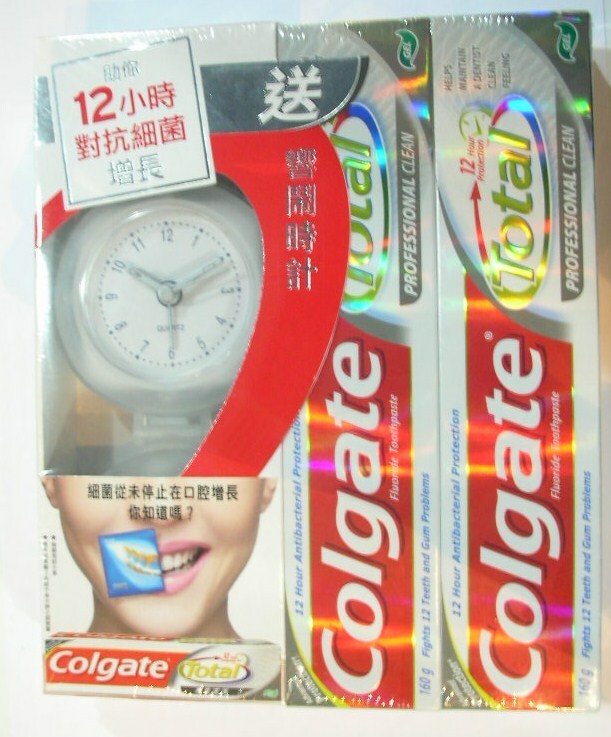 To gain further customer recognition in Hong Kong, Colgate’s latest advertising promotion is to give away an alarm clock with every purchase of 2 packs of their toothpaste and it is priced very competitively at 39.90KHD (approx 5USD). One major failing on this campaign is that Colgate did not imprint their logo on the alarm clock and this really missing a key opportunity to capture the attention of the customer. People wake up to their alarm clock every morning and Colgate should have seized this opportunity to remind people to use their product. Otherwise the alarm clock is almost a perfect concept (some companies in China shy away from giving clocks due to cultural tie in with theme of death, but more on that another time). Colgate wants to get their message across and have printed on the box, “12 Hour Antibacterial Protection” – thus giving away an alarm clock is one of the best way to communicate their intentions to customers. A cover attached for easy storage and to act as a stand when in use. Frosted plastic cover all round – can see the mechanism inside the clock.